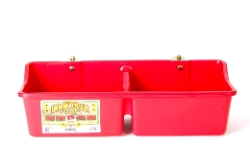 The 16 quart feeder is built of farm-tough, high-density polyethylene for superior strength. The built in divider allows for simultaneous feeding or separating pellets, feed, and supplements. Heavy duty steel brackets allow the feeder to hang on wire, pipe, and board fences. The hook over feeder is ideal for horses, goats, sheep, and llamas.